Given the staggering cost of new kitchen and bathroom cabinets, it's no wonder that homeowners often turn to painting as a cost-effective alternative way of changing the look of their cabinets. Not only that, painting gives you complete freedom to exercise your creative potential. No longer are you bound by a set number of cabinet finishes. 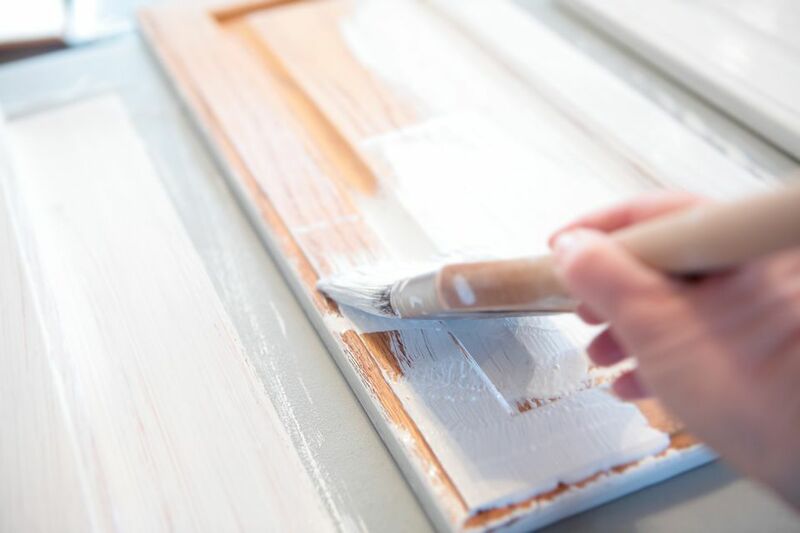 While you have leeway as to paint types in other areas of the home, cabinets need paint that is hardy enough to withstand repeated touching, food and liquid splashes, and other physical impacts. Choosing standard interior acrylic-latex for your cabinets may seem like a good idea at first, but you will find that it lays down in streaks and easily peels. What you need is a paint that is either designated specifically for cabinets or another type of paint that is especially cabinet-friendly. Here are seven cabinet paint brands that you can count on to produce a rock-hard, smooth, self-leveling surface. Farrow & Ball holds a hallowed position in the world of home design trend-setters, revered for its innovative colors and high durability. Formed in England in the waning days of World War II, Farrow & Ball's products are now found in the U.S. at premium paint suppliers, as well as online. Available in over a hundred colors, Farrow & Ball's Full Gloss paint is ideal for high impact areas such as cabinets. This eco-friendly zero VOC paint is easy to wipe off or wash, as it comes with a 95-percent gloss. Wiping down Farrow & Ball Full Gloss is like wiping down glass, porcelain tile, or metal. By way of comparison, Farrow & Ball's flattest matte finish paint is 2-percent gloss. Not only is high gloss functional, but it is back in style. Designers are increasingly using high gloss paints on typically gloss-averse surfaces such as ceilings and walls. This paint costs about twice as much as even the premium paints found at your local home center. Farrow & Ball Full Gloss, while superb at creating a mirror-like super glossy cabinet surface, is probably best used sparingly due to its high cost. High gloss paint is often the go-to product when it comes to cabinets. Higher glosses translate to lower surface porosity, so stains and fingerprints don't stick as easily. But what do you do if you want a lower sheen, such as satin, for your cabinets? Benjamin Moore's Advance Satin paint produces a silky, lustrous satin sheen, a departure from the mirror-like sheen of full gloss paints. Also available in semi-gloss and full gloss, Benjamin Moore Advance offers a huge palette of over 3,500 colors. Professional painters like Advance's low viscosity. This thinner product allows for faster painting, yet the paint retains structure after drying, and edges are crisp, sharp, and precise. Advance Interior behaves like an alkyd, or oil-based, paint but is a water-based paint. This allows you to clean up with warm water. This family-owned company's products are the best-kept secret of professional door, trim, and cabinet painters. Fine Paints of Europe's products are not found in many brick-and-mortar stores, so online ordering is your best bet. This Vermont-based paint maker leads the way with its innovative products. White alkyd cabinet paints tend to yellow over time. The rigorous conditions found in kitchens and bathrooms do even more to promote yellowing. So, if a tough white cabinet paint is your desire, Fine Paints of Europe produces the cabinet-ready Eurolux Acrylic. The company feels so secure about Eurolux Acrylic's colorfastness that it guarantees it will be non-yellowing under all circumstances. As befits a super-premium paint, Eurolux Acrylic is very expensive and costs on the order of the Farrow & Ball Full Gloss. Fine Paints of Europe is serious about painted cabinets, and it addresses the perennial problem of wood grain telegraphing through paint layers with a product called Brushing Putty. This is a high-build sanding primer which is brushed over the wood and is sanded down to conceal the grain patterns. Valspar's Cabinet Enamel is a cabinet-specific latex paint that behaves much like oil-based paint. A hybrid, Valspar Cabinet Enamel is a latex interior paint that is oil-enriched. Oil is the magic ingredient in paints that has long produced streak-free surfaces. Majority oil-based paints have largely been discontinued since 2005 due to their non-green high volatile organic content (VOC). You can still buy majority oil-based paints but only in limited, one-quart quantities. Unlike oil-based paints, Valspar Cabinet Enamel does not require petroleum products such as turpentine for clean-up. Warm water and soap are all you need. One advantage of choosing Valspar is its ready availability since you can find it at your nearest Lowe's Home Improvement store. Cost is comparable to the Benjamin Moore Advance paints. Rust-Oleum Cabinet Transformations is not just a paint but an entire cabinet coating system. It distinguishes itself from cabinet paints in that it is a multi-layered system that promises a transparent protected surface upon completion. By using Cabinet Transformations Deglosser, you eliminate the need for laborious sanding and cleaning before painting. After applying two bonding coats there is an optional glaze, followed by the all-important protective top coat. Similar to the Valspar Cabinet Enamel, Behr's Alkyd Semi-Gloss Enamel is formulated for surfaces that need durability and washability. This paint is water-based but has the characteristics of an oil-based paint. Behr Alkyd Semi-Gloss Enamel is a strong, reliable, self-leveling cabinet paint that is found at all Home Depot stores. This paint is a good choice when you want to control project costs but maintain quality. Excelling at treating surfaces that have adhesion problems, Insl-X's Cabinet Coat is marketed as a trim- and cabinet-only paint. Insul-X Cabinet Coat's urethane-acrylic formulation promotes better sticking properties than other paints. Cabinet Coat dries to a hard surface and it even lays down well on difficult surfaces like Formica and melamine. Cabinet Coat comes in a white enamel that is ready to go or in a tint base that will accept pigments at paint stores.